You are here: Home / Sellers / Detour – Out of Town Lenders at Work! 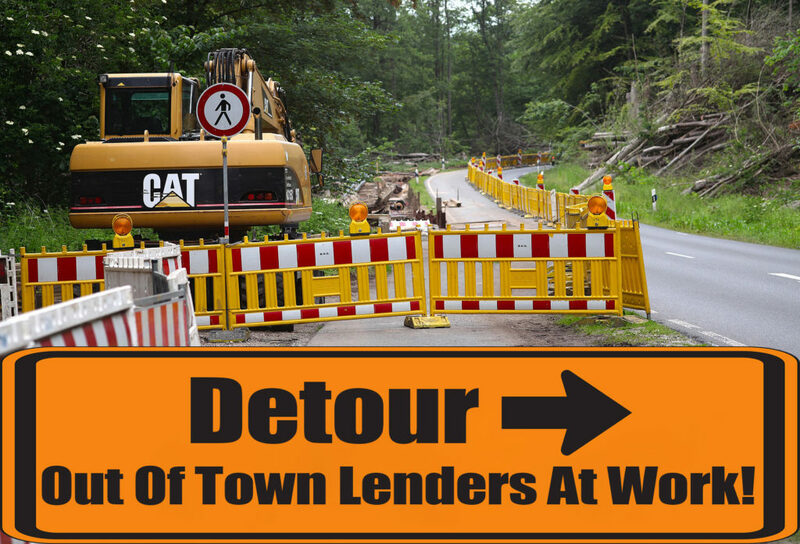 Detour – Out of Town Lenders at Work! With all of the road construction going on right now we have to really depend on road signs to help us get where we need to go. A mortgage lender can be much like a street sign. A good lender can save you from embarrassing delays and roadblocks, while a not-so-good lender, can take you down a painful road of detours. While there are some out-of-town or internet lenders that do a good job, we recommend finding a LOCAL lender. Local lenders know our market. They know where all of the potholes are. Local lenders are, well, local! They are your neighbors. You see them in the grocery store. They usually have more at stake in making sure that your transaction goes smoothly. Another problem with out-of-town lenders is that you never know what you are getting. Promises of cheap rates may be offset by fees that are higher than are customary in our market. Be sure to get all of the facts in writing. Usually our local lenders can meet or beat any “deal” you can find elsewhere when you compare apples to apples. Finally, with an out-of-town lender you may never be able to speak to the same person. Often you are just a number while your loan gets passed from clerk to clerk. Many times important terms of your contract, such as the projected closing date, may be ignored, causing delays and friction between you and the seller of the property. Delays by the lender can even cause a buyer to lose his earnest money at no fault of the buyer. With a local lender you can discuss your loan with an actual person that, if necessary, you can reach across the desk and strangle. Problems can usually be worked out in time for closing, or at least in time to get the closing date extended. Local lenders support our community. I believe that whenever possible we should “Buy Big Country.” Not all out-of-town lenders are bad, and not all local lenders are good. It’s a good idea to seek the advice of your agent to find out the experience of other buyers. Your Realtor does this every day. Like a good road sign, a good lender will take you where you want to go.